In our search for a rugged fishing knife, Gerber has submitted their AO F.A.S.T. 3.0 for review. The knife features a spring-assisted one-handed opening with Gerber’s patented Forward Action Spring Technology, as well as a heavy duty design; both of which are contained in a surprisingly portable and lightweight knife. As a point of information, the AO F.A.S.T. 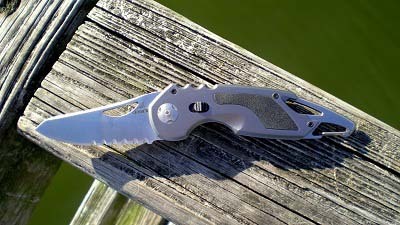 3.0 knife is a new design that was released by Gerber in 2010. There is no Gerber AO F.A.S.T. 1.0 or 2.0; the 3.0 merely refers to the blade length of the knife. In addition, the knife has a durable design that is built to withstand harsh outdoor conditions, as well as fit comfortably in your pocket for prolonged use out on the water. Forward Action Spring Technology: The Gerber Forward Action Spring Technology (F.A.S.T.) snaps open quickly when deployed, and locks the blade of the knife firmly into place. 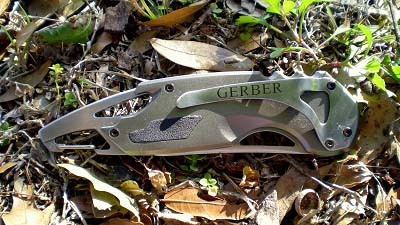 The Gerber F.A.S.T. offers one of the best spring assisted opening systems on the market. Handle Material: The AO F.A.S.T. 3.0 knife features TacHide inserts on both sides of the anodized aluminum handle. However, the grips could be extended to cover a larger area of the handle which would provide a better grip when using the knife in wet conditions. Surgical Stainless Steel Blade: The Gerber modified drop point blade is designed for strength and corrosion resistance and the serrated edge sharpens easily in the field. The half fine and half serrated edge allow for both cutting and ripping applications. Safety Mechanism: The safety mechanism on the AO F.A.S.T. 3.0 centers around the small black button on the aluminum handle of the knife. When the button is slid upward and the red dot is visible, the knife is unlocked and the blade is able to open freely. When the button is slid downward covering the rod dot, the knife is then locked and the blade will not open or close. Once the Forward Action Spring Technology assists in opening the knife, Gerber’s locking system keeps the blade locked open until you slide the button upward and close the blade at the same time. It can be done with one hand, but it is recommended to use two hands to close the knife safely. Carabineer Clip: The carabineer clip built into the end of the knife provides an easy way to attach the AO F.A.S.T. 3.0 to a tackle bag or backpack, which is very useful while fishing. Bottle Opener: The carabineer clip doubles as a bottle opener. Enough said. When I first examined the Gerber AO F.A.S.T. 3.0 knife, I came to the conclusion within a couple of days that the knife was rugged, and that it contained a lot of innovative Gerber technology. After working with the knife for a period of eight weeks, I have found not only that my initial observations were correct, but also that the knife also offers great applications for bass fishing. I have found that the Gerber AO F.A.S.T. is the first knife that I grab from my drawer when I am looking to open something quickly, and it has started to become the first knife that I grab to take out on the water. Working with the AO F.A.S.T. out on the water is surprisingly simple. The one-handed opening powered by the Gerber F.A.S.T. system is easy to use, and the spring in the knife provides a solid kick when the blade opens. The carabineer clip that is built into the back of the knife makes attaching it to any available object very easy; this will definitely help prevent you from losing your knife to the water. At an open length of 8.2’’, the knife is fairly large, yet it still clips comfortably onto your pocket and it will not weigh you down. The pocket clip on the knife is very secure, and it maintains the perfect balance of retention and removability. In addition, the knife performs very well for a variety of common fishing tasks, including cutting line, modifying lures, and working with live bait. In terms of a fishing knife, there are several parts of the design that could be improved to make it better for angler use. First of all, the TacHide inserts on the knife are too small to actually gain any advantage in terms of grip when the knife is wet; expanding the size of the grips and altering the position could provide a better hold on the knife. In addition, the AO F.A.S.T. belt clip and safety mechanism are not designed for left-handed use. The spring-assisted opening works fine using your left hand, however, working with the lock is awkward and requires turning the knife over and using both hands to close it. The AO F.A.S.T. 3.0 is an impressive spring-assisted opening knife that has a variety of features that are applicable in any fishing situation. The carabineer clip attaches easily to any available loop and the spring-assisted opening blade makes one-handed use incredibly easy. Be sure to opt for a fine blade over a serrated blade as it will provide the best performance for freshwater fishing applications. Overall, the AO F.A.S.T. 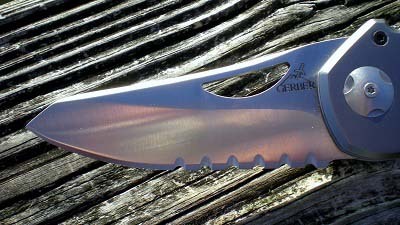 3.0 is a very practical fishing knife and Gerber’s F.A.S.T. technology screams fisherman-friendly.